Parent-Child Interaction Therapy (PCIT) was originally developed by Dr. Sheila Eyberg to address early childhood behavior problems and promote pro-social and emotional development in young children. PCIT is a two-stage, behavioral parent training program which guides caregivers to develop authoritative parenting skills that balance a warm relationship with the child and effective limit setting. PCIT targets patterns of parent-child interaction rather than focusing on specific target behaviors by having a therapist actively coach a caregiver during real-time interactions with the child. PCIT was designed to provide a developmentally sensitive treatment format for young children, featuring play-based learning opportunities as the primary medium to facilitate behavior change. PCIT has an extensive evidence base for a range of early childhood problems, and PCIT repeatedly receives the highest rankings among reviews of evidence-based treatments. 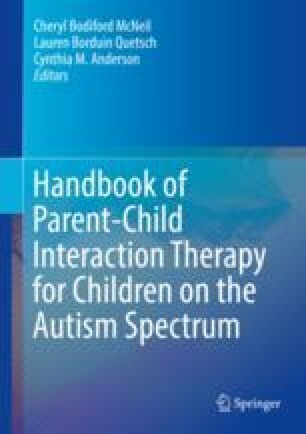 This chapter is designed to provide information on the theoretical and historical underpinnings of PCIT, review the core features, describe the format of treatment, and illustrate how PCIT has been utilized in different settings to meet the needs of children and families.